Here's the scenario: You use Media Shout for presentation, but you create all your graphics on your Mac. When you copy your files up to the Media Shout computer, you end up with a bunch of grayed out .ds_filename files on the Windows drive. Because they have the same filename, your volunteers keep clicking on them, not realizing that they are unable to be used. Then you have to clean the drives up all the time. Not so efficient. Turns out the Mac OS will create those little files to store Finder comments, searching information and other stuff. Those files are hidden in the Mac OS, however, Windows doesn't know what to do with those files and just gives them to you, grayed out. 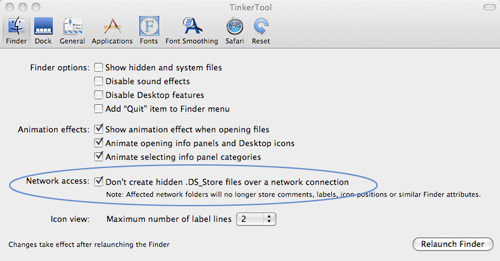 TinkerTool does a lot of cool things with your OS. It allows you to make changes to settings that are already there, but you just can't access easily (without using Terminal, anyway). You can have a lot of fun with it, but what we're interested in is the setting to have Finder stop creating those pesky little .ds files. To do this, just go to the Finder tab, and select the right option (below). Note that this stops creation of these files on all networked drives, including other Mac volumes. This is not really a huge problem, but it will slow down searching a bit on those drives. For me it's worth the trade off. Don't forget to click the "Relauch Finder" button after you make the changes. If you forget this step, it won't take.